Adventure of the Seas, another Voyager class ship from Royal Caribbean, has been cruising from the UK since 2013, offering departures from Southampton. This family friendly ship offers superb facilities, a fun-filled atmosphere and little something for everyone onboard. Adventure of the Seas spreads her 138,000 tonnes over 15 decks, while carrying up to 3,114 passengers onboard. Boasting many of Royal Caribbean's signature features, including the Studio B ice-skating rink and shows, the Royal Promenade and a rock-climbing wall, you will be onboard one of the best equipped ships at sea. Adventure of the Seas also features superb dining options, from Johnny Rockets '50s style diner to the gorgeous main dining rooms. 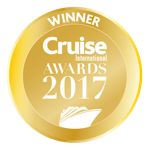 With superb facilities and great itineraries the Adventure of the Seas offers great cruise for couples, groups and families a like. Upgraded Feb '14: Adventure of the Seas now features a new outdoor movie screen, ship-wide Wi-Fi and concierge club. Vintages Wine Bar will be refreshed, and the Park Café, Chef's Table & Giovanni's Table will be introduced. As with all Royal Caribbean ships, Adventure of the Seas boast an incredible choice of dining options, including My Time dining. Whatever your mood there will be something to suit your taste buds and dress code. Head to the Mozart, Strauss & Vivaldi Main Dining Rooms to sample the fantastic food, with formal nights offering that traditional cruise dinner feel. The Windjammer Cafe will keep you fuelled 24 hours a day and is a great option if you fancy casual dining in the evenings. For a themed-bite, head to Johnny Rockets for the '50s feel and American diner fare, Ben & Jerry's ice cream parlour will keep you cool through out the day and the specialty Italian restaurant, Giovanni's Table, is ideal for a romantic meal for two or to celebrate over dinner. The entertainment onboard Adventure of the Seas, is as you would expect from Royal Caribbean, second to none. From the ice shows in Studio B to the Broadway-style productions in the theatre. The ship also boasts the latest's films and a great selection of activities from golf simulators to rock climbing walls. There is also a fantastic selection of lounges onboard, head to the British-style The Duck and Dog Pub for a beer or pop down to the Schooner Bar to sample one of the fabulous Martinis. For glamorous nights there is the Champagne Bar and to party the night away head to the Viking Crown Lounge of the Jesters Nightclub. As well as all this there is the Adventure Ocean kids club and the Optic Teens Disco, to keep the younger cruise generations happy and to offer them an escape from their parents! Whatever your age there is always something to do or somewhere to go onboard Adventure of the Seas. The Spa and fitness facilities onboard cruise liners is becoming and increasingly important part of a cruise and the Adventure of the Seas doesn't disappoint. The Day Spa & Fitness centre offers fantastic facilities and a great range of treatments, plus the adult only solarium offers a calm and relaxing pool to while away you day by. There is the Adventure Beach family pool, full sized sports courts, a 9 hole mini-golf course and much more. After all the great food onboard there is definitely an activity to help you burn off those cruise calories. If all that great entertainment, the wonderful facilities or the charming lounge bars aren't enough for you, then there is always the boutique shopping, the quiet surroundings of the library or the selections of art onboard to admire. For family cruises the Adventure Ocean programme offers entertainment, learning and fun for kids of all ages, as well as offering somewhere for youngsters to avoid their parents!